The environment in Phoenix, Arizona, is ideal for subterranean termites. These termites require with plenty of wood to consume. While most people think Arizona is a dry, hot desert, subterranean termites nest bar underground, allowing them to become a major problem for homeowners in a hurry. It is important to receive a termite inspection in Phoenix if you are planning on buying a new home, or you are concerned about termites. Our Pest Control Clients Love Us! Check Our What Our Clients Are Saying! Subterranean termites will create shelter tubes up from the ground underneath your home. Warm temperatures combined with damp soil from rainfall leads to an increase of termite activity. In Arizona, most termites will come up through the plumbing and utility openings of a home. It is common to see mud tubes on the slab foundations. Higher termite treatment in Phoenix immediately if you do spot mud tubes on the cement slab foundation of your home. Termites will start to tunnel through support beams and behind walls, causing serious damage to a home. If you need a termite inspection in Phoenix it is important to have it done as soon as possible. Unlike other household pets, termites are incredibly destructive to home and will quickly cause structural damage. Homeowners with damage in support beams are facing thousands of dollars in repair costs. This is why it is essential to pay for termite control in Phoenix each year. Catching termites early can reduce the excess costs associated with termite treatment. Termites are often active at night and during the rainy season. July to September is when the majority of termites will cause problems to Arizona homes. A well-developed colony of termites can include over 300,000 termites. Termites are known for quick reproduction and they can forage a territory up to almost 1 acre. The majority of homeowners will pay upwards of $3,000 to repair termite damage. Termites cause over $30 billion in damage to crops and other structures each year. Termite treatment costs over $5 billion each year. Termite control treatment in Phoenix will eliminate the colony of termites that are currently impacting your property. Once they are treated, termite inspection in Phoenix will identify areas that need to be repaired for the home to be safe. Repair all broken pipes and leaks in the home to prevent water from building up around the home. Install a proper drainage system around the foundation of the home to keep rain water from accumulating around the home. Repair holes and openings to the home. 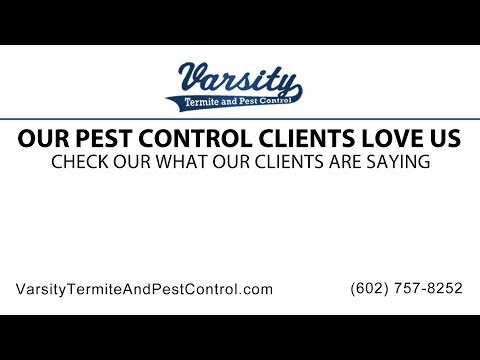 Working with the right company offering termite control in Phoenix is the best way to prevent termites from costing you thousands of dollars! Contact us today for more information!